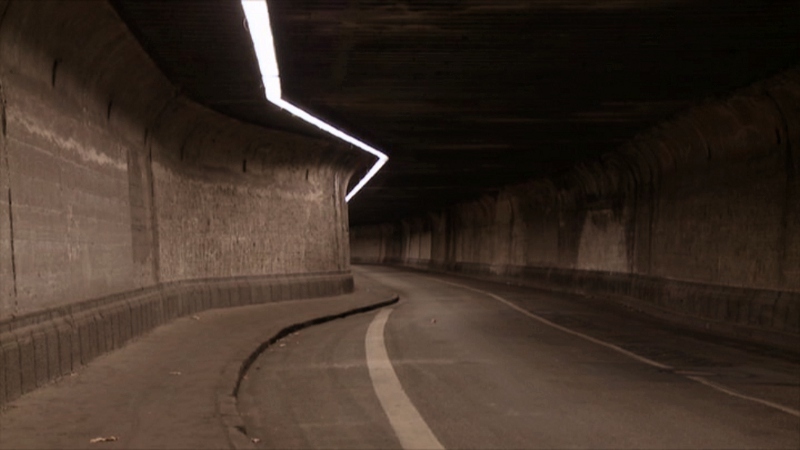 During a 2013 interview with American avant-garde filmmaker James Benning, the director expressed his type of "slow cinema" as an act of patience, comparing it to noticing how the appearance of light changes on a wall as its paint dries. So if that doesn't register in your brain as interesting on any level, stay far away from the bulk of his films. Often wordless, they showcase static shots of semi-related images and require a great deal of patience to even begin appreciating. A long-time advocate of 16mm film, Benning finally caved in to modern technology within the last five years, partially as a means to archive his older material. Some of this older material has made its way to DVD, but this two-disc collection includes a pair of newer documentaries by the 62 year-old director. Benning's career-long loyalty to 16mm film was finally broken with Ruhr (2009), the first production of his to be shot digitally...and also the first to be produced outside the United States. 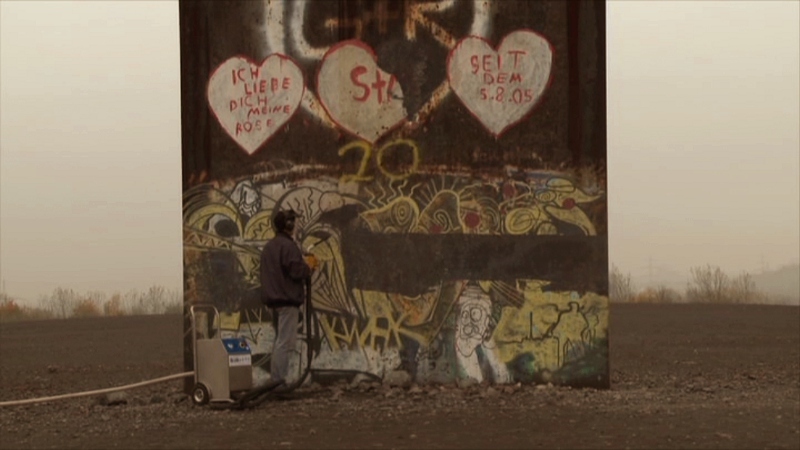 Filmed in the urban Ruhr Valley in eastern Germany, this series of seven static shots showcasing life in the industrial belt plays continuously and with no added distractions. Described as "a modern-day city symphony", Ruhr is a quite a stretch at 122 minutes and, to the uninitiated, might feel like some sort of practical joke at times; this is never more evident than its second hour, which features one single unbroken shot of a processing tower that occasionally billows smoke. As the film equivalent of "background music", productions like Ruhr are interesting enough from a certain perspective...but let's face it: very few people will watch it more than once without keeping their fingers near the fast-forward button. In contrast, the more recent Natural History (2014) is an easier jumping-on point for Benning's brand of filmmaking. Though still wordless and thus much less accessible than more traditional documentaries, this commissioned trip through Vienna's Natural History Museum is still oddly fascinating at times. The longest shot in the entire production runs about five minutes, with others just several seconds long...and, of course, it feels much more brisk that Ruhr at just 77 minutes total. Though both feature landmarks and landscapes that the average viewer will never visit in the flesh, something about Natural History's detached showcase of jarred animals and lifeless exhibits feels much more alien and curious than the industrial world of Ruhr. Watch this first, and move on if you're ready. Though the bulk of James Benning's output has an obvious through-line from a certain perspective, Natural History and Ruhr share obvious similarities and seem like a logical pairing for this DVD double feature. Produced by Austrian Film Museum as part of a long-running series (which also includes a number of other Benning films), this two-disc set lets both films stand separately, equipped with modest but satisfying A/V presentations and at least one quality bonus feature between them. But obviously enough, this collection is strictly for established fans only. Since both films represent a new stage in the director's career---the use of digital cameras instead of 16mm---there are times when it feels like he's not comfortable with the new equipment. In other words, both Natural History and Ruhr often look a little flat and unremarkable at times, with relatively dull colors and an overall soft appearance. Whether this was a result of lesser equipment, natural lighting, or by design, these 1.78:1 transfers can only do so much with the source material; at the very least, they're satisfying and don't display any flagrant digital imperfections. The compositions are strong and eye-catching, and the long static shorts don't seem to waver in terms of quality as natural lighting changes in the background. 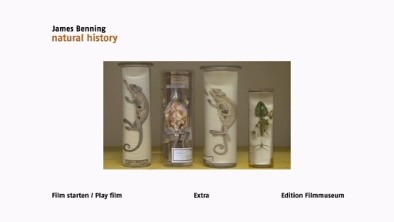 The more recent Natural History looks smoother and more polished overall, but the largely indoor-shot production was handled in a more controlled environment. DISCLAIMER: The compressed screen captures featured in this review have been resized and do not represent DVD's native 480p resolution. The Dolby Digital 2.0 mixes are hardly immersive but this seems completely by design. Channel separation is apparent and these non-traditional soundscapes---which basically include background noise, rather than a mix of narration, music, and/or dialogue---have a flat sonic presence and, like the visuals, emphasize ordinary occurrences instead of a stylized approach. As such, no optional dubs or subtitles are needed and thus not included. The simple menu interface includes options for playback and bonus features, while only minimal pre-menu logos and warning screens must be dealt with beforehand. This two-disc release arrives in a clear hinged keepcast with double-sided artwork and a booklet featuring essays and descriptions. Both are printed in English and German. Just two extras in total, but one of them is quite good. "James Benning: Circling the Image" (84 minutes) is a feature-length 2003 documentary directed by Reinhard Wulf. Lightly touching on earlier periods of the director's career, Circling the Image features words from Benning himself and a number of his films including The United States of America (1975), Grand Opera: A Historical Romance, North on Evers (1992), and the forthcoming 13 Lakes (2004). Overall, it's well worth watching for fans of the director...and though it feels like it should've been a stand-alone release instead, I'd image anyone halfway interested in seeing it won't mind getting it as part of this collection. The other extra is a short Trailer for Fire and Rain (2009), the second of his films to be shot digitally. 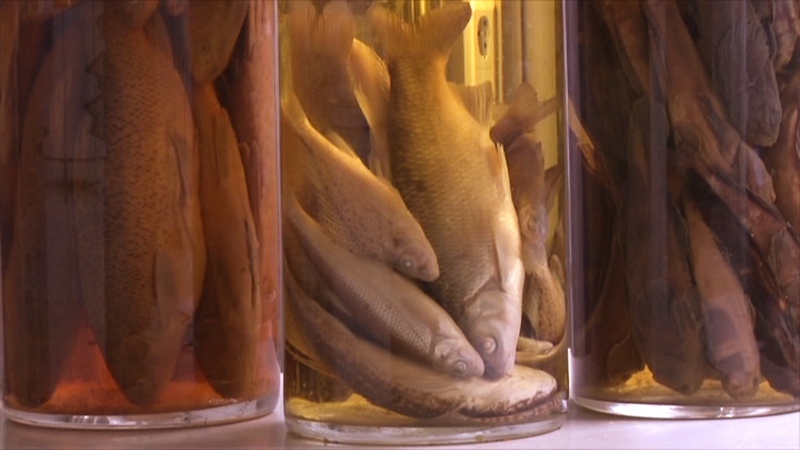 Natural History and Ruhr, two films by American filmmaker James Benning, are linked by their visual approach, technical background, and area of origin. Other than that, they're almost polar opposites and the more accessible Natural History is a better starting point for those unfamiliar with Benning's work. But either way, new viewers should dig around to make sure if this is material they'd like to own; I doubt many folks would make a blind buy and be 100% satisfied with this one. But the DVD package (no Blu-ray?) is good enough, with a decent A/V presentation for both films and one worthwhile feature-length supplement. Mildly Recommended for established fans only.